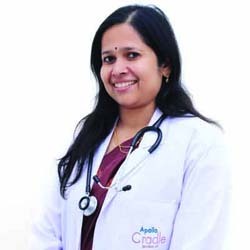 Dr. Jasmin Rath is a Gynaecologist and Obstetrician in Apollo Cradle, Kondapur, Hyderabad who is well trained in Laparoscopy, Ultrasound, Managing High-Risk Pregnancy, And Normal Pregnancy, all Gynaecological and bleeding problems, PCOS and infertility management, menopausal problems. She is having 8 Years Of Clinical Experience. Dr. Jasmin was my gynecologist at Apollo Cradle. I delivered a healthy baby there under the special guidance of a wonderful team. My postnatal care was also the best. The best hospital in the locality. My choice is always Apollo Cradle and I will recommend this to my friends and family. The services are wonderful and surely you will feel much satisfied. All the nurses and doctors are always available. My best regards to Dr. Jasmin Rath for delivering my baby safely. Dr. Jasmin was my gynecologist at Apollo Cradle. She was too caring and helpful. She was available round the clock. My special thanks to housekeeping staff for cleaning my room and offering timely services. Dr. Jasmine is our best gift in live. She had been my strength during my pregnancy. Her affection towards the patients is mind blowing. I and my family will be thankful to her always. Apollo Cradle had given me the joy of motherhood. I\’m extremely happy with all the facilities and services at Apollo Cradle. We live in Singapore and were looking for a hospital of equal standard in Hyderabad, and found Apollo Cradle\’s facilities to be world class. We would be happy to recommend this hospital to our family and friends, and come again.